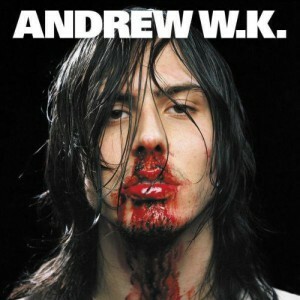 I Get Wet is a short collection of non-stop, hyperactive party anthems by an extreme extrovert named Andrew WK, who draws stylistically from 80’s hard rock and the glam rock scene while fusing it with the speed and simplicity of punk rock. The average length of each song isn’t much over 3 minutes and most of them barely take a moment to slow down. The music is dominated by the guitar and has keyboard and piano lines playing alongside it with thumping hard rock drums not far behind, whereas the bass is pushed underneath all of this and you’ll have to listen intensely if you want even a small chance of hearing it. The album is accompanied by an overly sleek production style where everything is loud, fast and repetitive, leaving little space for variation. This might sound negative but when put into practice it has a surprisingly positive outcome, although it’s worth noting that this could have just as easily been the downfall of the album. Most of the lyrics are straight forward and are presented largely in the form of mantras and shout along anthems, all of which will get firmly lodged in your head for weeks after listening to them. Themes strongly revolve around partying to your last breath, women (Girls Own Love and She is Beautiful), motivation (Got to Do It and Don’t Stop Living in the Red) and more partying. There are two oddities that break away from the established formula for the lyrics. The first is about killing people in Ready to Die and the other is I Get Wet, which seems to have been written from a woman’s perspective but is barked non-stop almost entirely by Andrew WK for the duration of the song and you can’t possibly keep count of many times the title line is repeated. It does feature female vocals for the last part of the song, which are probably there to break up the snarling and yelling voices momentarily. At the end of the day I Get Wet is a big, loud, straight forward, over the top party album that lacks any form of subtlety where you don’t need to engage your brain but you will get hours of fun out of it so long as your tongue is planted firmly in your cheek.